It’s time again for some digressions about obscure television topics. The long-running series “Monk” from USA Network was set in San Francisco but it was rare that an episode had a strong connection to the city. That was probably in part by design since it was primarily filmed across the Los Angeles area (an urban back-lot at a studio, Long Beach, the Santa Monica pier, LA’s Union Station, etc. 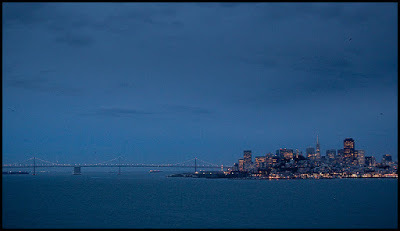 ), with strategic stock footage of San Francisco and rare location shoots in San Francisco. When there was something specific to San Francisco, it was often weird. Something isn’t right about that background. While you try to identify the flaw, let’s switch to the subject of Richmond (or The Richmond District). “Mr. Monk and the Bad Girlfriend” (S6E4) has some confusing geography. Captain Stottlemeyer’s girlfriend (a wealthy real estate agent named Linda Fusco) supposedly lives in the city of Richmond (at 12:41, Lt. Disher points to the city of Richmond on a map to indicate Linda’s city of residence). During a visit to Linda’s house, the Captain arranged to have an illegally parked truck in front of her house towed away. Later in the episode, we find that the truck has been towed not to a Richmond lot, but a San Francisco Police Department lot. Why would the city of Richmond tow a truck across the Bay to a city of San Francisco lot? When you start from the Richmond District, however, you get to drive over the Golden Gate Bridge, which is always a thrill (the scenery around the Richmond-San-Rafael Bridge is quite nice, but the bridge is oppressively utilitarian). My guess is that the writers were thinking of San Francisco’s Richmond District — a mostly residential area between Golden Gate Park and the Presidio — and that there was some confusion during prop preparation and/or filming. 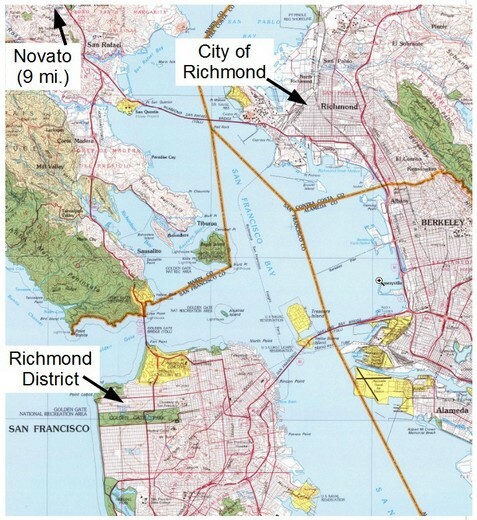 On most maps (like the one above), the text for the city of Richmond is much larger than the text for the Richmond District (if it is even marked). Linda is supposedly a superstar real estate agent, so I’m not sure why the writer’s didn’t pick a elite and well known San Francisco neighborhood like Pacific Heights or Nob Hill instead. Perhaps Richmond is an inside joke like Vinton Street? “Mr. Monk is Up All Night” (S6E9, IMDB page) has a quick mention of Richmond as Monk is waiting in the “Caltrain Station” while searching for a mystery woman (it’s actually Los Angeles’ Union Station — San Francisco doesn’t have any grand train stations). There’s a strange broadcast over the station’s speakers: “Local service for Richmond and Burlingame, Track 12” (24:33). That’s a weird broadcast, because there is no Caltrain that makes that run (Caltrain doesn’t go to the East Bay), there is no Amtrak that makes that run (Amtrak runs on the eastern shore of S.F. Bay with bus connections to S.F. ), and BART goes from the Peninsula to Richmond but not as far south as Burlingame (Millbrae is the southern terminus). Coincidentally, as I was writing an early draft of this post, the food scene in the Bay Area had Jonathon Gold fever, as the documentary City of Gold was playing and Gold was making several appearances in the area. In a quick interview with Eater S.F., he made a similar Richmond / The Richmond slip-up, though in this case he actually was referring to a place in the City of Richmond: “Daimo has the best wontons anywhere in the U.S. It’s in that Chinese mall in the Richmond. It’s pretty good, but [the restaurants in there] switch around a lot.” Perhaps this one was a transcription error. Have you figured out what is wrong with the newscast background? The image is reversed! When looking at San Francisco from the north, the Transamerica Pyramid will be to the right of the Bay Bridge, not to the left like the newscast background shows. It’s weird — perhaps an intentional “Easter Egg” for viewers? Or a necessary tweak to allow the inset photo to appear on the right side of the screen while maintaining a full view of the Transamerica Pyramid? To further see for yourself, point Google Earth to 37°48’31.93″ N 122°24’08.86″ W, eye altitude 625 ft; or go to Google Street view, drop the viewer on Alcatraz Island, and spin around until you can see San Francisco; or take a look at a few more photos from Flickr: by Mike Lewis, by Doug Sandquist, by Harvey Quamen. The scene out Monk’s window in season-1 opening credits is also reversed left-right. One Embarcadero Center is on the wrong side, and the sun reflecting off Transamerica is on the wrong side. Thanks for the information about the additional reversal, I’ll check it out!